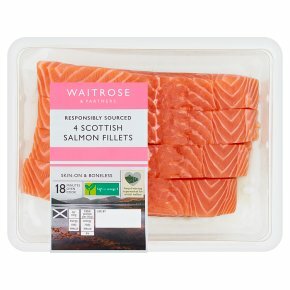 Four rich and succulent boneless Scottish salmon fillets. Serve with buttery hollandaise & baby potatoes for a simple classic. Poach. Time: 10-12 mins. Remove all packaging. Place salmon in a shallow pan of boiling water, simmer for 10-12 minutes. Pan Fry. Time: 10-12 mins. Remove all packaging. Heat a dessert spoon of vegetable oil in a frying pan over a medium heat. Pan fry fillets for 10-12 minutes, turning occasionally during cooking.